The Cement Barn manufactures some of the best Patio Table Sets around! Our Patio Table Sets are built to last and designed to withstand the outdoor elements year round year after year. 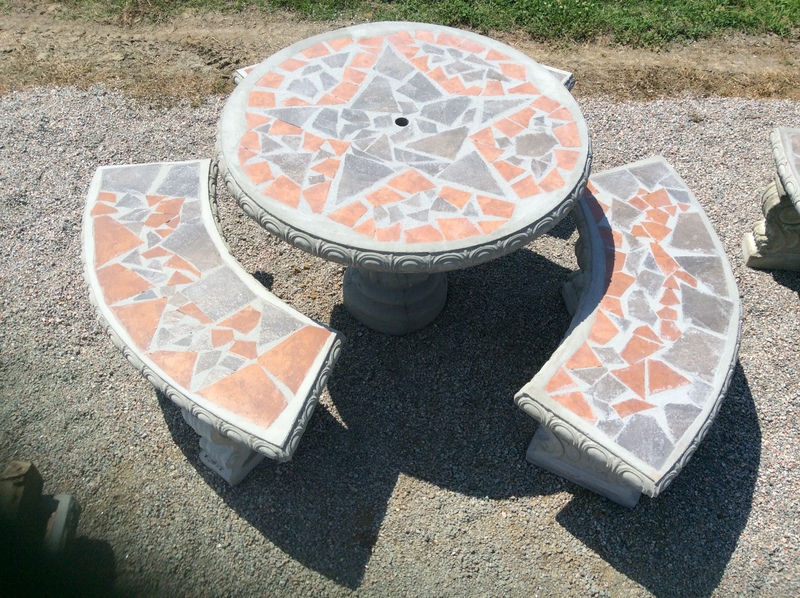 The Cement Barn’s Patio Table Sets are cast out of quality concrete materials and reinforced with metal for extra support and stability. 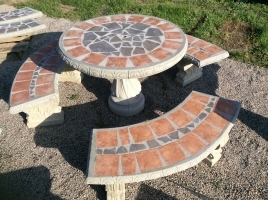 These Patio Table Sets will be there for you and your family and friends to make memories that will last a lifetime every time you are ready for an outing! 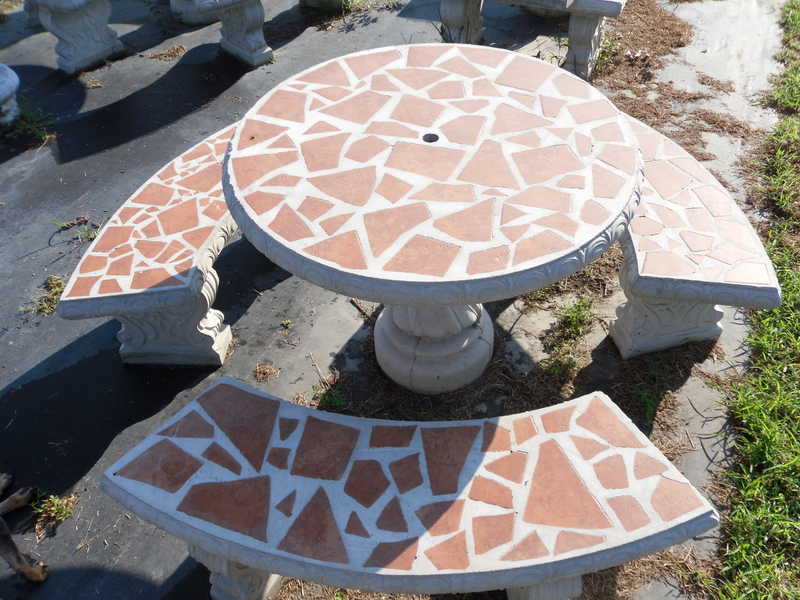 As shown in our catalog, we proudly manufacture several styles and designs of Patio Table Sets ranging from small to large. 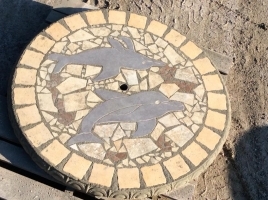 We offer many color schemes of tile inlay and mosaic designs which are incorporated into the concrete during the casting process. 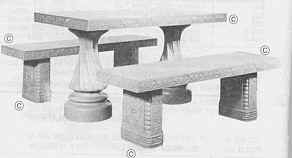 Several designs and colors are shown in our catalog below and that particular color or design is identified by the item number. 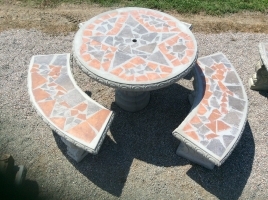 However; if you would like a particular color scheme to match your home or your landscape on any Patio Table Set we offer please Contact Us as we do many Custom Patio Table Sets. Are you tired of bad weather blowing over and damaging your patio set? Invest in a set that will NOT be blown over! 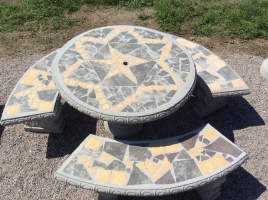 These Cement Patio Sets are heavy enough to withstand the wind and will be there when the storm passes! 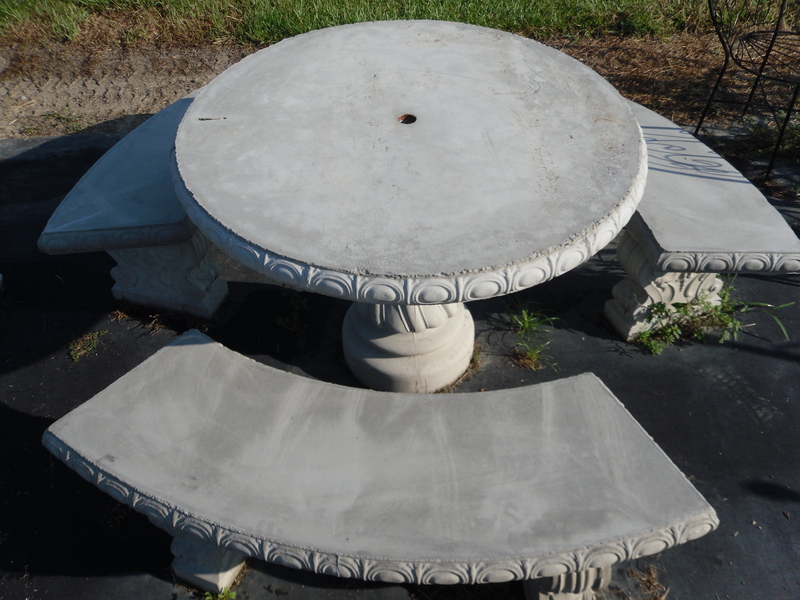 Our 42″ Round Table Sets are the most popular and weighs a total weight of 1,600 lbs of solid cement. 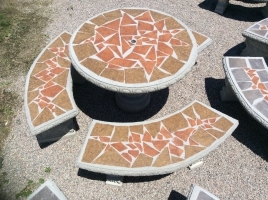 The table top and table top pedestal have been manufactured with a 2.25″ hole in the center to accommodate a standard patio umbrella. The diameter of the hole for the umbrella can be adjusted upon request to accommodate our customers needs. Little to no maintenance of theses table sets are needed from year to year. 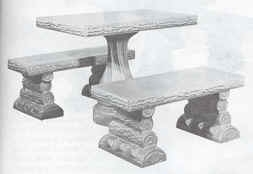 Over a period of time you will notice a weathering process occurring to your Table Set. Instructions on how to keep your Outdoor Patio Set clean will be found on our General Maintenance page. We offer shipping for any of the sets listed in our Online Catalog! However; shipping is an extra cost added to the table set. Shipping cost are based on weight and location and vary from one location to another as these are delivered via Motor Freight Liner. These sets are heavy and are shipped via Motor Freight on Pallets. You can find out more information about our Shipping Policy and Shipping Details in the Shipping Our Statuary page. 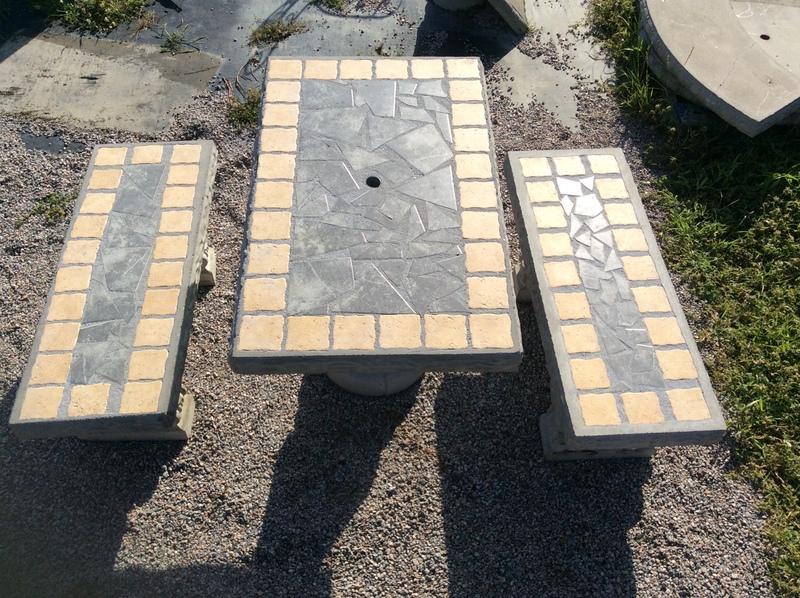 Protect your Patio Table during the Winter Months with this durable 100% waterproof polyester cover. 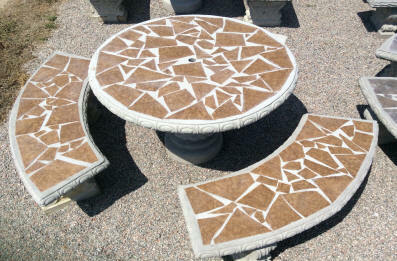 These Patio Table covers are 100% Waterproof made out of top quality Polyester fabric UV Stabilized against the sun. Drawstrings and Bungie Ties allow for the cover to be tightened around the base of the statue to secure the cover during windy conditions, brass eyelets and a heavy-duty tie and cord lock will also prevent the cover from blowing away. Easy to clean surface allows you to simply wipe the cover down to clean it off. These covers offer full winter protection for your statuary when used properly. 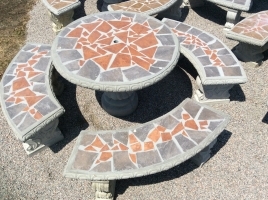 Please contact us and we will help you pick the proper size for your Patio Table Set. If you have an item that needs a cover that we do not have listed, or simply would like help figuring out exactly which cover would fit your item best, please contact us and we will assist you in finding the perfect cover for your item.